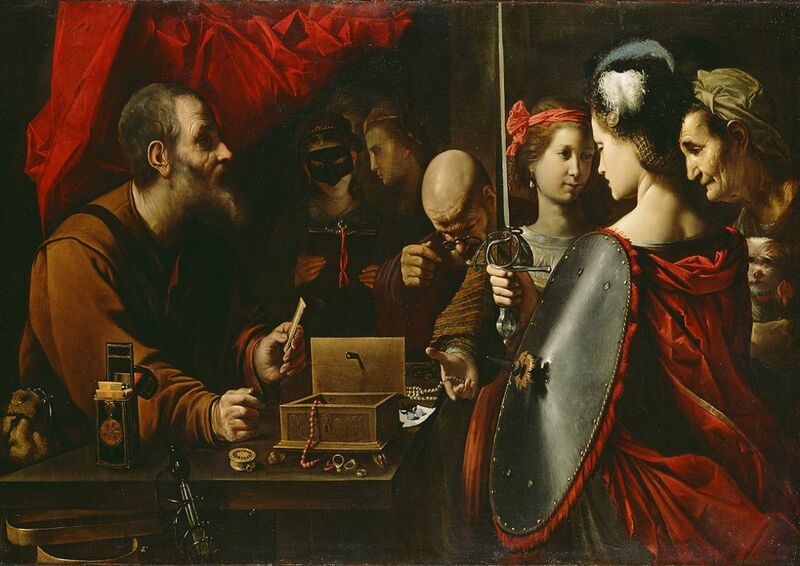 Achilles, dressed in women's clothing, holds a shield while admiring a sword. Based on ancient legend, Achilles' mother, knowing that her son would die if he fought in the Trojan War, disguised him as a woman and entrusted him to King Lycomedes' household, where he lived among the king's daughters. When war threatened, Ulysses and other Greek chieftains were sent to fetch him, knowing they had to trick him into revealing himself. Cunningly, they deposited a heap of gifts before the women: jewelry, clothes, and other finery, but also a sword and shield. When it came time to select from the gifts, Achilles instinctively grasped the weapons, thus revealing his true identity. Pietro Paolini placed his figures in a dark, shallow space, dramatically lighting the figure of Achilles. Additional highlights illuminate the faces of the other figures and pick out the shiny jewelry and weapons. The youthful, smooth complexions of Achilles and the king's daughters contrast with the aged, wrinkled appearances of Lycomedes and his wife.